Reading and share top 21 famous quotes and sayings about Beauty In The Eyes by famous authors and people. 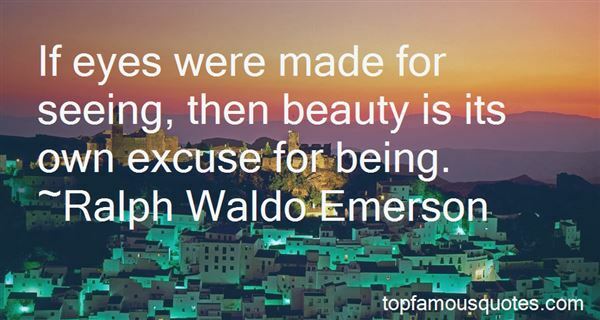 Browse top 21 famous quotes and sayings about Beauty In The Eyes by most favorite authors. 1. "I was completely astonished by the beauty of nature. Our eyes see just a small fraction of the light in the world. It is a trick to make a colored world, which does not exist outside of human beings." 2. "Do you hear it?" Samuel asked, his eyes penetrating. "I don't hear it...but I know it's there." I struggled to express something that I'd never put into words. "Sometimes I think if I could just SEE without my eyes, the way I FEEL without my hands, I would be able to HEAR the music. I don't use my hands to feel love or joy or heartache - but I still feel them all the same. My eyes let me see incredibly beautiful things, but sometimes I think that what I SEE gets in the way of what's...what's just beyond the beauty. Almost like the beauty I can SEE is just a very lovely curtain, distracting me from what's on the other side...and if I just knew how to push that curtain aside, there the music would be." I threw up my hands in frustration. "I can't really explain it." 3. "Blake waited until she set her deep gray eyes on him. "He has no idea the beauty in front of him. He's a fool. "His words made her heart glow. She smiled and looked at her hands." 4. "She wore a loose-fitting purple velvet Pre-Raphaelite gown, and her abundant dark-brown hair flowed down her back and shoulders to her waist. As she drew near, I noticed her warm brown eyes peeping at me beneath lush, un-plucked brows, her smiling red lips and smooth, un-powdered cheeks almost begging for kisses. She possessed a beauty much different from Daisy, more like a wildflower in the unspoiled earth than a prize-winning rose in a formal garden. However, her Pre-Raphaelite fashion might have been an affectation of a different kind, a bit closer to nature but a stylish imitation just the same." 5. "The beauty that addresses itself to the eyes is only the spell of the moment; the eye of the body is not always that of the soul." 6. "No mirror can highlight the beauty within you than your own eyes. No eyes can fairly judge your appearance than your own pride." 7. "His eyes beheld beauty not in reality but in the printed word. Standing in the waiting-room, he realized that in his life he had accepted secondary experience -- the experience of reading someone else's thoughts -- over real life." 8. "I followed Jared outside and eyes the slick, black beauty parked on the curb. "What is that?" Jared sighed. "It's a Vulcan." "Weird. I thought it was a motorcycle." 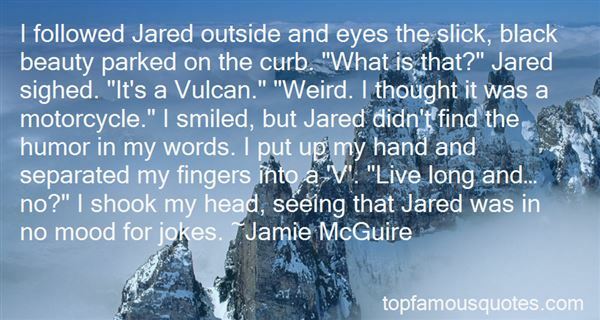 I smiled, but Jared didn't find the humor in my words. I put up my hand and separated my fingers into a ‘V'. "Live long and…no?" I shook my head, seeing that Jared was in no mood for jokes." 9. "Oh, My God..." Even as he saw the face and heard that voice say "Crow..." he was throwing himself backward out of the shaft. Then the top of the elevator car blew out and the air was filler with shrapnel, everybody hit the deck, and crow grabbed his crossbow, yelling, "Get back! It's him, the vampire!" But it was too late. The vampire rose with the grip of a single beautiful hand, almost levitating toward them, his power and eyes and smile and terrible beauty so alien but so familiar, so pale but so solid, so horrible but so magnetic. And he came closer and closer. "Get back," ordered crow, and the Team started to obey. 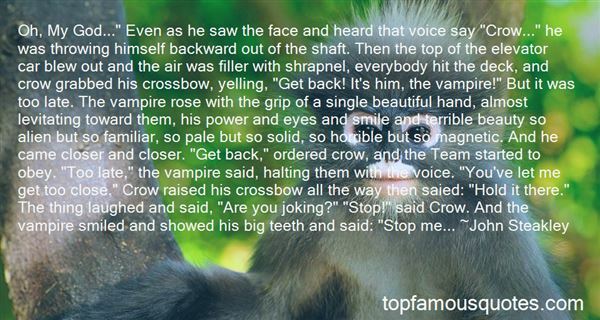 "Too late," the vampire said, halting them with the voice. "You've let me get too close." Crow raised his crossbow all the way then saied: "Hold it there." The thing laughed and said, "Are you joking?" "Stop!" said Crow. And the vampire smiled and showed his big teeth and said: "Stop me..."
10. "Panicked, she dropped the suitcase and started edging away. In her haste she caught the backs of her knees on the arm of the sofa, lost her balance and landed flat on her back on the cushions.His eyes gleaming with amusement, Nick looked at the delectable beauty sprawled invitingly across the sofa. "I'm flattered,honey, but I'd like something to eat first.What are you serving-besides baked shoes?" 11. "I opened the door and stepped in. Raw pain filled me at the sight of my painting. 'Show me what it looked like, before the fire.' His request surprised me, but I did as he asked. With eyes closed, I projected the exact details of the painting I had poured my soul into. Just as I had experienced his love of surfing in a visceral way, he shared not just the visual beauty of my work, but the love and passion with which I had dedicated myself to it. 'Thank you. Now, it will never truly be gone.' I choked back a sob and went to Mr. K's office." 12. "For with eyes made clear by many tears, and a heart softened by the tenderest sorrow, she recognized the beauty of her sister's life—uneventful, unambitious, yet full of the genuine virtues which 'smell sweet, and blossom in the dust', the self-forgetfulness that makes the humblest on earth remembered soonest in heaven, the true success which is possible to all." 13. "There he was. The infant Titus. His eyes were open but he was quite still. The puckered-up face of the newly-born child, old as the world, wise as the roots of trees. Sin was there and goodness, love, pity and horror, and even beauty for his eyes were pure violet. Earth's passions, earth's griefs, earth's incongruous, ridiculous humours - dormant, yet visible in the wry pippin of a face." 14. "Relax," the woman said. "It's just me. ""Just you?" Hale asked with heavy irony, remembering the black leather and predator's eyes with a stab of heat. Dangerous beauty had always been his downfall. "I'm watching your back. ""Sure you are," he snorted. Beauty or not, he wasn't stupid enough to trust. Screw, sure. Trust, no way." 15. "If eyes were made for seeing, then beauty is its own excuse for being." 16. "You can tell me anything, her eyes say, because I will see the beauty in everything you say." 17. "True beauty is what lies inside of us, not what the world sees. A beautiful shell that houses a vile soul becomes sullied over time. But an outer shell, imperfect as it may be, that houses a beautiful, shines with that beauty, radiating it for all who have eyes to see." 18. "A BOYOut of the noise of tired people working,Harried with thoughts of war and lists of dead,His beauty met me like a fresh wind blowing,Clean boyish beauty and high-held head.Eyes that told secrets, lips that would not tell them,Fearless and shy the young unwearied eyes --Men die by millions now, because God blunders,Yet to have made this boy he must be wise." 19. "After I see a painting, I go into a room, I close my eyes and I slowly escape into the beauty of the painting. I reflect on the painting, the nuances of the artwork, it's theme, mood and highlights -until the magic of the painting flashes before me." 20. "What you need to drive out an old passion, is a new passion, a greater passion. What you need is an over-mastering positive passion. [...] Just as Rachel was Jacob's over-mastering passion, the passion of his life, Jesus is our "Rachel". To the degree, that you see Jesus on the cross, loosing absolutely everything for you, He will become a beauty to you, He will become so beautiful in your eyes that you'll be able to change these things that controlyou now, they'll loose their power.Do you know how to work on your heart like that? It's only by rejoicing in and resting in what Jesus Christ has done for you. Then you can replace your idols. And if you really want to change and want to pound the Gospel more deeply into your heart - Jesus Christ must become your over-mastering positive passion." 21. "No sooner have you feasted on beauty with your eyes than your mind tells you that beauty is vain and beauty passes"
Nobody or Nowhere? Fern: I'd rather be nobody at home than somebody somewhere else.Ambrose: I'd rather be nowhere. Being nobody when you're expected to be somebody gets old.Fern: How would you know? Have you been nobody?Ambrose: Everybody who is somebody becomes nobody the moment they fail."